Born to a South African mother and a Nigerian father. She falls in love with a Nigerian lover and they both have a visionary instinct to re-build the unimaginable business that has once lost its essence. But were they able to tunnel through their thundery challenges as two love birds…? Ayanda is an international, multi- award winning movie that has been premiered and screened in the U.S., U.K., South Africa and Canada. 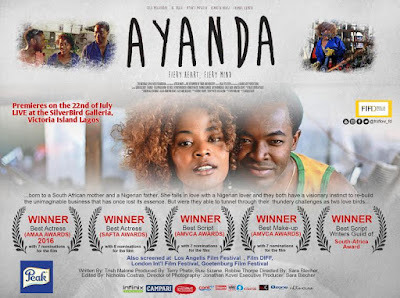 It stars the dexterous international award- winning South African actress Fulu Moguvmani and the New York Film Academy trained International Nigerian actor, O.C. Ukeje. Venue: Silverbird Galleria, 133, Ahmadu Bello Way, Victoria Island, Lagos.  Best Script Writers Guild of South Africa. New Movie Alert! Nollywood Is At It Again See This New Movie Titled “Zuckerberg In Lagos” LOL!